This is truly sad. As per Cynthia S.'s comment about destroying humanity. "Humanity" isn't very humane. We humans still may find the way forward in peace and love and if not mama Earth will go on with out us. This is such a horrific site. I believe they are beaching themseves for a reason and it's OUR job to find out why! Yes, I agree. It's really sad and I wonder why they get stranded!? I AM THOROUGHLY DISGUSTED THAT THIS HAS HAPPENED IN THE FIRST PLACE AND THEY KILL THEM??? ISNT THIS ENOUGH WHEN THEY BEACHED THEMSELVES??? THE POOR THINGS AND I AM SO VERY SORRY. This makes me more than sad, ...and makes me cry! Not good. Could this have anything to do with sonar and noise in the ocean? It seems to be a worrying trend at the moment. Around the time that the Navy was testing its new sonar system, which many marine biologists indicated would be harmful to marine mammals, there were mass strandings of whales. Autopsies revealed that these whales died from the benz - they had surfaced so fast to flee the noise from the sonar that they were not able to properly readjust to the changes in pressure. I do not think that was what was going on here necessarily, but human activity could very well be disrupting how cetaceans navigate. There is so much noise pollution in the world that it is difficult for whales to communicate with each other through their whale songs. Blue whale songs used the be able to be heard up to 3000 miles away, meaning that these large creatures could lead relatively solitary existences and still be in contact with their own kind, but that is increasingly difficult now. There is so much that we do not know or understand. William Kirkham's comment is very thought-provoking. Always sad to hear. Noted. This is so sad. It just breaks my heart. 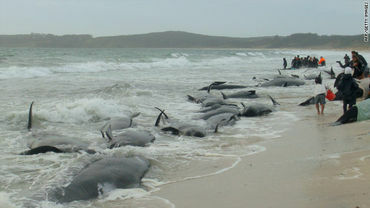 These beachings usually happen for a reason, and unfortunately we may never know why tese particular whales beached. Sometimes one or two whales have a problem, and being the social creatures they are the other whales rush to be with them, and end up beaching enmasse themselves. There's so much to learn about these and other whales, if only we don't kill the all first! Je trouve cel� extr�mement triste! C'est peut-�tre un signal nous disant d'arr�ter de poluer la mer par les signaux sonores de tous ces bateaux...ou sinon je ne sais pas,mais ce n'est surement pas arriv� sans raison. Yes William what you say is true. And I believe we are killing our ocean's and earth with the things that being done. It is a shame. God gave us something wonderful and in return we have set out to destroy it. Then we whine and cry about it. Something has to give, mother earth is pissed and I don't blame her. We only have ourselves and progress to thank for it. I fear the worst is coming. And taking God out of everything has not added to our survival. Obviously SOMETHING is causing these whales to beach. I don't think they are committing mass suicide, not intentionly anyway. Wonder if MAN has done anything to cause this??????? It is very sad, sometimes nature doesn't make sense just like the rest of us. This does happen on occasion, it's almost like one goes and the rest follow, very sad. i wish we knew what caused this but William K. is right. The sonar causes problems and that is what we know is underwater. If the whole world thought the way we do to protect and live with nature maybe this would not happen. Keep changing...reduce your footprint on the world any way you can. We need to put some of our money into finding the answers to way this happens and how we can help. Rather then spending trillions of dollars on War and greedy big business tax breaks. Heart breaking ...and worrying !!! WHY OH WHY ARE THEY BEACHING THEMSELVES? IS THIS SOME KIND OF WHALE RITUAL??? OR IS IT JUST THE EARTH CONFIRMING THAT WE ARE IN THE PROCESS OF COMPLETELY DESTROYING EVERYTHING THAT IS GOOD HERE? THIS IS INCREDIBLY HEARTBREAKING... THEY ARE SUCH BEAUTIFUL AMAZING CREATURES! THERE MAY COME A POINT WHERE WE WON'T EVEN BE ABLE TO HELP AT ALL ANYMORE. I DO KNOW HOWEVER THAT THIS IS NOT MY FOREVER HOME, AND NOTHING HERE WILL LAST FOREVER, BUT IT'S SO VERY HARD TO WATCH. I hope the rescuers at least have some success, even one would be great. i wonder if whales beached themselves before the industrial revolution? One must try everything to put them back to safety. Why does a whale beach itself? We don't know. Maybe they have a death wish and wish to die? Don't whales have any rights to live the way they want to? What right do we ever helpful humans have to interfere? But then we allways did know what is best for everything??? We, the "crown" of creation can leave a nightclub when the music is too loud. The whales prefer to commit suicide instead. But this doesn't interest the military the world around, they "need" their f.... sonar. very anguishing to see suffering like this! Whales are touching animals. The poor whales, hope they manage to get the rest back to the sea. So very sad, I agreed with what Willian said .. I hope they manage to get some of them back out to sea. Marine mammal stranding has always been a mystery. Further conservation research would be helpful. Noted. So sad and I wonder if what William K said was true. I live in New England and there are often stories or whales beaching themselves, but why, remains a mystery. Very sad and I believe they're not really sure why whales beach themselves. Hopefully the answer will come soon. The whales know why they beach themselves. It's a pefectly natural thing for a whale to do. It's what they want to do, not for us to judge them for it. Let's leave them alone? How many whales have been re-launched into the sea only to swim a few miles and do it again? Mankind has been interfering with nature for too long now and we all know the repercussions of that. Perhaps these whales have a disease and wish to isolate themselves from the rest of the pod to avoid spreading it? Perhaps they have been ostracized from the pod for some other reason? Maybe just voluntary euthanasia? It was their choice so it is probably not in their best interest to be returned to the sea? The rescuers obviously have good, if not misguided, intentions but not all the answers so why not trust the whales instinct and leave them be. Freedom of choice? Or don't we extend human rights, civil liberties to mammals? Clever us know best? No, I am not inhumane, just a realist. PS: Whales were beaching themselves long before sonar was invented. Very sad. Man has got to be to blame. Refloating the poor whales is virtually impossible! First of all they are too large just to turn around without massive effort but has anyone ever done a scientific study of why these whales beach in the first place?